I’ve got this new goal of trying to eat better and healthier and to not eat out as often. In trying to achieve this goal, I visited Trader Joe’s to see what kind of snacks I could wrangle up to help me out. I took a class this week and the dietitian running the class said that most of the people who have lost weight and kept it off have consistently done a few things. One of those things is that they eat more often during the day, eating smaller meals throughout the day. Most of us try to eat less during the day and then “save up” for the big dinner and then snack at night at home. I thought it was an interesting point to make and I wanted to find a variety of snacks for myself. One thing I saw at Trader Joe’s today was this: Green Beans. But not just any green beans. Crunchy and lightly salted. I was intrigued. Opening up this bag of green bags did one trigger at least: my dog came running into the room to try to beg for any kind of treat that came out of a crinkly plastic bag. After trying a few of the green beans, it was happily surprised. I wasn’t quite sure what to think of them. They are indeed very crunchy. They’ve got a little salt on them but I wouldn’t really call them “salty”. They also have this sweet taste them to as well – it’s got a little bit of the sweet/salty combination going on and it’s satistifingly crunchy (one of my favorite textures). They don’t totally taste like green beans though, in the same way that potato chips don’t totally taste like potatoes. The flavor is there but its not strong, like some of it got zapped out when they magically transformed them into being crunchy. So there you have it. Crunchy vegetables. Tasty crunchy vegetables in fact! And these aren’t terrible for you either – 1 serving (3/4 cup) is 130 calories and 4.5 grams of fat (but none of the bad fat). It’s not better for you than eating actual green beans, but they make for a tasty alternative snack to other types of crunchy vegetables (I’m looking at you, potato). I wonder if they’ll try this with anything else? Even if they don’t, I’ll be satisfied with this new snack in my pantry. Hi there. 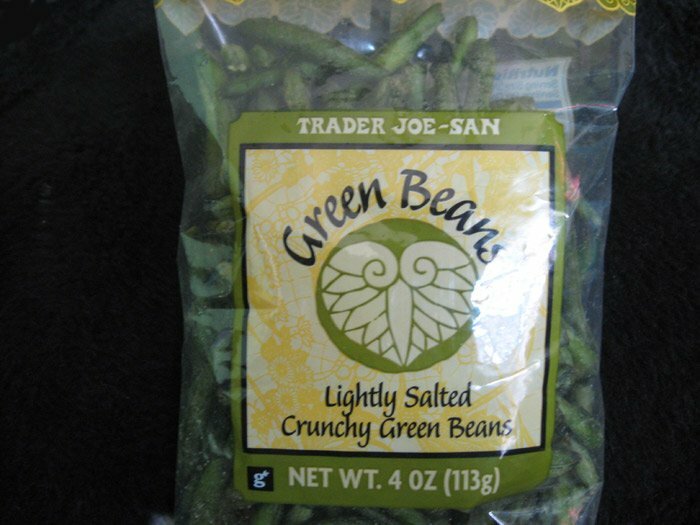 I saw these green beans at trader joe’s, and wanted to try them as well. Mitsuwa market off balboa ave carries a crunchy mixed vegetables. 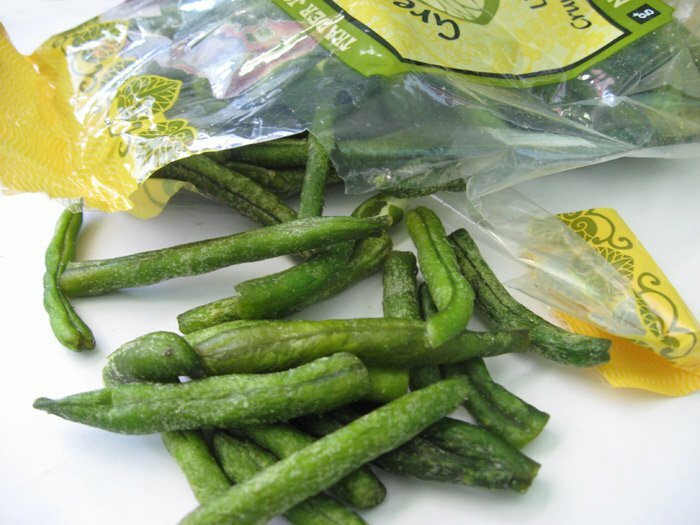 Since you liked the green beans, I’m sure you will love these if you haven’t tried them yet. Their mixed vegetables are made of carrots, okra, squash, green beans, and a few others I can’t remember right now! Also, if you haven’t tried them yet.. the dark chocolate covered edamame are very good too! Ohh, I think I have to make another visit to Mitsuwa then! I haven’t been there in awhile. Maybe I can pick up some other kind of treat to try out for the blog. Thanks for the tip, Jenn! Just as an FYI, our mission is to help friends, family, neighbors and fellow San Diegans find the best local businesses and stay away from the worst. And right now, we have a special program going on right now (in a nutshell: write reviews for gift certificates) so if you’re interested, please give me a call at 858-436-7048. Talk to you soon! These are so delicious! They have a sweet and lightly salty taste. My 3yo daughter was reluctant to try them, but when she did she took the bag from me. I can’t understad why they are expensive. Trader Joes has the best price, from my recollection it’s $3.99. Most other places sell them for $6.99. I’m scouring the internet to find a recipe so I can make them myself.